Some time ago I wrote about the origins of the humble pavlova, because I got interested in trying to find out where it was created (here): Australia or New Zealand. At the writing of the previous piece, I was awaiting the arrival of Keith Money's biography of Anna Pavolva. I managed to get a copy of this book, and had a good look through it. 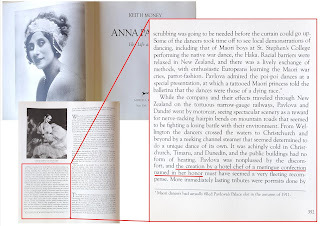 From what I can gather, Money's 1982 Pavlova biography is "the most comprehensive and perhaps the most accurate biography of the dancer" (Gale Group Inc., 2004). Money apparently drew on many documents and archives from the time including access to the performer’s own documents as one of the British Royal Ballet’s biographers. When it comes to the history of the Pavlova, unlike the reportage by Tracey Tufnail of the Vancouver Sun (15 February 2015), Money did not state that a hotel chef “in the country's capital city of Wellington invented a dessert inspired by Pavlova's tutu, which was decorated with green silk roses. His metaphorical representation with its light, soft meringue and cream filling was garnished with emerald green slices of kiwifruit to represent the roses”. 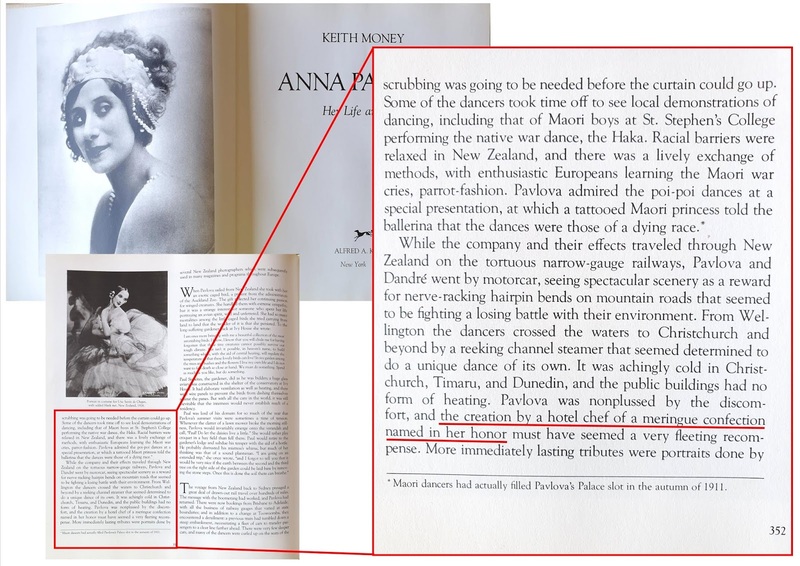 In fact, ALL that is said of the dessert in Keith Money's biography of Anna Pavlova is that, when journeying through the South Island of New Zealand - Christchurch, Timaru and Dunedin - in June and July of 1926 (Melita, 2009), there was “…the creation by a hotel chef of a meringue confection named in her honor…” (Money, 1982, p. 352). No mention of tutus, green silk roses, lightness, cream or emerald green kiwifruit anywhere. This statement appears to have been creative licence by Tufnail (15 February 2015). It may have been written elsewhere, but I have not yet found this in any 1926 reports. I had been unconvinced about the Vancouver Sun story, as I was dubious about 'Chinese gooseberries' - as they were then known - being in a dessert created in June or July of 1926 (Melita, 2009). Chinese gooseberries would have been too sour and too small - not to mention well out of season - to have gone into a dessert in winter. The modern, sweeter Kiwifruit only appeared in 1959, and did not rise to international prominence until the 1980s (New Zealand History, n.d.). It appears that I was right to be skeptical. As previous researchers (noteably Emerita Professor Helen Leach, 2010) have reported, the creation of the Pavolva apparently stems from 1926, with the first documentation found in the Australian edition of the Davis Gelatine Company's Davis Dainty Dishes in that year. However, the research is silent on what month this recipe book was published. If the Australian edition was published later than June or July, it might imply that the Pavolva was a New Zealand creation - or at least a New Zealand named creation - after all. I have emailed Emerita Professor Leach to find out if she knows the month of publication, and have ordered her book, The Pavlova Story, to see if there is any other information to be gleaned.